Weight loss without a ‘diet’ is the only reality! ‘How many people do you know that have been on a ‘diet’ to lose weight?’ Probably more than half of your friends even if they don’t admit it. Why wouldn’t they admit it you might ask? Generally because it didn’t work. Why do we keep hoping that this time the quick fix will turn out to be the long term answer to our slimming prayers? Mostly media hype and the inability to believe that we can reach our goals without drastic action. Common sense when it comes to food seems to desert us so we turn to others for help. When people come to me I teach them the common sense approach to regain a healthy relationship with food. This is not a quick fix but a permanent one. Surprisingly it is not our energy (calorie) intake that has changed over the last 50 years but our energy expenditure. Think how little we actually need to move during a normal day compared to pre car/television/remote control/mobile phone etc. times. It is no wonder we have struggled to match our calorie intake to our reduced energy expenditure. But match it we must if weight is not to be gained. 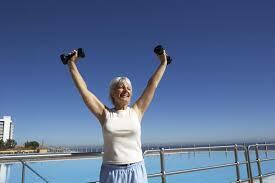 The body will react to exercise and a change in diet whatever your age so it really is never too late! Yes it’s true that the ability to produce muscle proteins decreases with age but it is also true that this can be delayed significantly with exercise. The most significant change is after the age of 50 and having just ‘celebrated’ that milestone I really couldn’t care less that it is called sarcopenia (sarco meaning muscle, penia meaning wasting, if you speak Latin of course!) however I was cheered to know that women lose less muscle than men and if anyone suggests that is because they have more to start with it will spoil my day! So there is no time to waste, remember the better you feel the healthier your lifestyle choices are likely to be. Small changes that are sustainable and can be kept up for life will give you more energy, confidence and most importantly, better health. It really is a win, win situation and that is the reality.